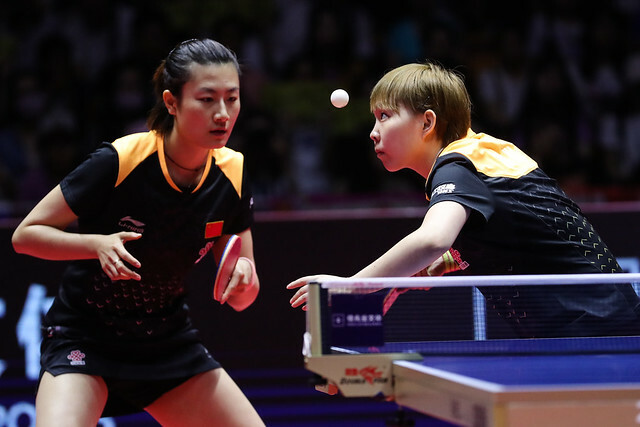 The newest table tennis Olympic gold medal event, the Mixed Doubles event, is making its ITTF World Tour debut today at the China Open in Shenzhen, China. Mixed Doubles was announced by the International Olympic Committee (IOC) in 2017 to be part of the Table Tennis Olympic programme for the Tokyo 2020 Olympic Games, which means table tennis will have five gold medals on offer for the first time. In order to promote the Mixed Doubles pairings for its Olympic debut, and to provide more value for the ITTF World Tour, the Mixed Doubles event will be played at five World Tour events (China, Japan, Korea, Australia & Austria) & the World Tour Grand Finals in 2018, as well as at all 12 ITTF World Tour events in 2019 and beyond. The China Open, which will be the first World Tour event to feature the Mixed Doubles event, will see 18 pairs fighting for the prestigious title in Shenzhen and began accumulating world ranking points and develop chemistry in the hope to qualify as one of the 16 pairs that will compete in Tokyo. Top Mixed Doubles pairs such as 2017 World Championships silver medalists CHEN Chien-An (TPE) & CHENG I-Ching (TPE), and bronze medalists WONG Chun Ting (HKG) & DOO Hoi Kem (HKG), as well as top seeds Mima ITO (JPN) & Masataka MORIZONO (JPN), will all be fighting to be named the first ITTF World Tour Mixed Doubles Champions. Chinese superstar ZHANG Jike, who thrilled his millions of fans on his return to the international table tennis scene at the Hang Seng Hong Kong Open last week, will continue to excite the crowd who have travelled from all over China to watch him play in Shenzhen. The 30-year-old Grand Slam Champion will be partnering with two-time World Junior Champion WANG Manyu in the Mixed Doubles event in hope of keeping the title on home soil. The Seamaster 2018 ITTF World Tour Platinum, China Open is the third of six Platinum events on the ITTF World Tour, which is the top tier of the ITTF World Tour with the most prize money and world ranking points. Together with the six regular ITTF World Tour events, players compete to earn World Tour Standings points qualify for the singles, doubles and mixed doubles events at the one-million-dollar World Tour Grand Finals in December. Other than the Mixed Doubles title, the other medals up for grabs will include Men’s Singles, Women’s Singles, Men’s Doubles & Women’s Doubles Gold.